Topps Allen & Ginter became an immediate hit when it was first released in 2006. It offered something new from something old. The set brought a great mix of mini cards, superstar autographs and relics, plus non-baseball and even non-sport cards. I have thoroughly enjoyed Allen & Ginter and my biggest three direct customers choose it as their favorite set to build each year. It's exciting to see that it's time for 2012 Topps Allen & Ginter. Over the years Topps has continue to mix it up with Allen & Ginter, although some collectors have not been as satisfied as they once were. Sure there have been some great autographs and relics along the way, and of course the minis have remained popular, but many felt the non-baseball inserts and minis began to take over. I welcome the oddball stuff, but to a degree. A few years back I could put a full 350-card mini set together in a matter of cases. For the past two years it has proved a difficult task, even after busting more than 30 cases. There were just so many versions of the small cards that the basic mini cards became tougher to find. Numerous parallels and other non-sport minis may have taken over, but it looks like Topps has corrected this a bit for 2012 Topps Allen & Ginter. For me, it was the one thing I picked up the phone on and called Topps and talked to them about it. In the past, the non-baseball mini inserts were falling 1:2.5 packs. That was too much. These sets became watered down, especially when many of them were just ten cards. The market value of those sets dropped to almost nothing after release. This year Topps seems to have listened as the 2012 Topps Allen & Ginter sell sheet now says that the non-baseball mini inserts fall 1:5 packs. That should lend to tougher sets, a better market, and more baseball minis while keeping the mix of non-baseball minis in. I can't wait! A strong base set checklist that sees legends return and a stellar autograph lineup has led to more buzz around 2012 Topps Allen & Ginter since 2006 when it debuted. This should be a fantastic release for Topps. 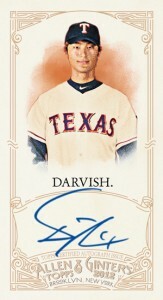 Check out our in-depth look at the non-baseball signers in 2012 Topps Allen & Ginter Baseball. While Allen & Ginter is popular amongst many collectors, for some it is not their cup of tea. The same can be said for case breakers. I often get asked if I think Allen & Ginter is a good case to rip. Tough question. I do enjoy it and purchase much of it. Any case can have one or two hits that should do very well in your collection or the secondary market, yet I often advise against it. Why? For the average case breaker who may be used to case prices ranging from $500-$750 for products like Topps, Bowman, Topps Heritage, or Bowman Draft, moving up to the $900-$1,000 range can be tough to swallow. For many, they feel it takes what potential there is and zaps it. Now, don't mishear me. I realize why it costs what it costs, and I still think at current levels it is a great product. But for most case breakers, they want something they can count on time and time again. That also means something less risky: lower cost, geared at set building and less dependent on the hits. I think Allen & Ginter has tremendous value. Where else can you get on-card autographs from a lot of these subjects? Or base cards of Albert Einstein and Regis Philbin? But, for some, cost versus risk remains a factor. In recent years, prices of Allen & Ginter base sets and master sets with short-prints have declined on the secondary market. Most case breakers are used to sets with short prints commanding a nice premium and collector's enjoy the chase of putting the set together. Allen & Ginter has a great formula but since there are 50 short prints at just 1:2 packs, sets are fairly easy to complete. This is in contrast to some of the more difficult set-building products like Topps Heritage and Gypsy Queen. Because they're easier to complete, prices aren't as high. 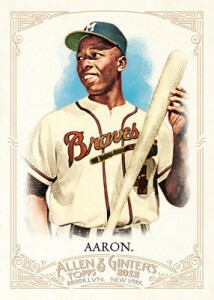 2012 Topps Allen & Ginter has many Hall of Famers and that helps, especially the singles market. However, the set will remain easy to complete. I don't mind this as it is unique to the brand and those who want the set can make one inexpensively. It's a good thing the set structure is different from other releases and appeals to different folks too. Yet, for some case breakers it is not the norm. Once again, cost comes into play. When sets are cheaper, it becomes more about the hits. Sure the base set is popular with nice designs and cards of folks you may never see again. But as I mentioned above, with less of an emphasis on set building, the product becomes more dependent on the hits to recoup your money. Topps has done a great job ensuring value outside the hits with inserts and minis. However, with a higher case price, we still have to rely on the hits. I think most everyone loves the the autographs, relics, Rip Cards and framed printing plates. For case breakers, issues arise when your hits are from the weaker people on the checklist. With the higher price point, the losses can add up faster if you hit two or three such cases. Most case breakers enjoy the set-focused products as those can recoup much of the case cost. Allen & Ginter is a mixture and does depend more of the hits than a base Topps or Topps Heritage release. In 2008, there was an influx of case breakers for Allen & Ginter. That's when the set prices began to dip lower than 2006 and 2007 levels. It also led some to say the product was doomed for the future. Yet, collectors still enjoyed it. Still, it caused many case breakers to take losses or fight hard just to recoup their initial investment. So some stopped doing case breaks of Allen & Ginter since that release. Others continued but had a difficult time. Yet, some are successful in smaller quantities. You don't always have to go big. Everyone is different and may have various avenues to sell. Try it and go from there. But it is hard for me to recommend to newer breakers only because I have heard of so many struggles. Allen & Ginter is a solid product. I know many collectors that choose it for their favorite release, or close to it, each year. Just like any product, you can buy a box or case or multiple cases and do well. Be careful, though, as the odds may be slightly against you in a large case break. However, that may change from year to year based on factors like set composition, checklist, market, supply. I have done well on Allen & Ginter but it has helped to have some customers that build master sets of every mini card and mini parallel. I even have one who goes after every card made. They need a source that will have quantity and be able to help in big ways. I enjoy helping them fill their sets and collections. Thanks to Allen & Ginter, I have developed personal friendships with them. Plus, it does not hurt that I collect many of the autographs myself as I enjoy mini cards and some of the more rare autograph subjects and personalities. I want to emphasize this is not a collector-focused view, as the collector in me loves Allen & Ginter. Shoot, even the breaker in me does regardless of profits and losses. It is a fun break and continues to bring new innovations (like the state relic cards last year) and strong value. This is intended to be a more detailed response to the questions I get about purchasing Allen & Ginter cases and towards the case breaker in general. It does not mean Allen & Ginter is not a strong product or break. I think it is both, but we all have various experiences and likes. Not everyone will experience the same results or breaks. Not every product should be about what it can sell for. However, in today's times and at today's costs of cards, I know it is a real question. Many of our focuses have changed over the years, but I hope for all of us we can still see the beauty in the cards and find enjoyment from hitting something great. If it is not what fits in your collection, then trade it or sell and get something you are looking for. Hopefully, something from Allen & Ginter will be included in your collection as it has been an important part of the hobby for several years now. On a final note, I get asked often if I ever try for the Ginter Code. I do not. I am too busy opening and sorting. Plus, code breaking isn't one of my strongest suits. I have helped many code breakers over the years by answering questions, supplying cards, scanning pictures, etc. It has been fun joining the process in a small way, but also time consuming as I know many hours, days and weeks are spent on it by many. Hopefully the 2012 Topps Allen & Ginter Code will be challenging and fun, just not as tricky or Twitter-focused as last year's turned out to be. Best of luck whether you are a collector, case breaker, or code breaker. 2012 Topps Allen & Ginter looks very promising. BTW Ill be looking for box toppers especially the currency, roller coaster, and highlight sketches. Still trying to find and complete my 2011 Ginter State Box Topper set. Gary McIntosh (ID 48687) � The Ginter Code set has 50 cards. It looks like it will use Twitter quite a bit this time around. It’s a murder mystery.